They are Fu (福), Lu (祿) and Shou (壽): Happiness, Status and Longevity, also known as the Three Stars (Sanxing 三星). 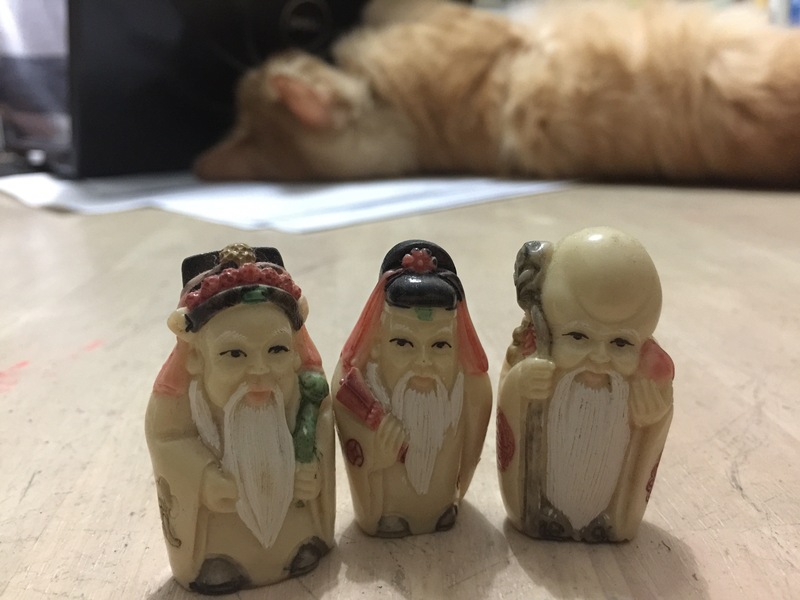 They sound like a particularly cheesy pop group, but actually, these three deities are the personification of actual ‘stars’, which, in Chinese astronomy, control the particular aspects that each god is thought to have influence on. The star of Happiness (Fu 福, Fuxing 福星) refers to the planet Jupiter, which is thought to be an auspicious star. You may also see this deity referred to as the God of Prosperity or Good Fortune as the Chinese believe that wealth and good luck lead to fulfilment. In Daoist mythology, Fu was once Yang Cheng, a governor of Daozhou in Western Han (206 BC – 24 CE). The governor apparently risked his life to advise Emperor Wu Dian of the Western Han Dynasty to treat dwarfs with respect. The Emperor released his dwarf slaves and Yang Cheng was deified and worshipped for his good deed. As a statue, this deity is depicted in scholar’s dress, holding a scroll, on which is sometimes written the character for ‘Fu’ 福. He is also sometimes portrayed with a child in his arms, or surrounded by children. I do wonder though if these are really children and not depictions of the dwarfs he defended. The star of status (Lu 禄 , Luxing 禄星) is Ursa Majoris or, according to traditional Chinese astronomy, the sixth star in the Wenchang cluster, which influences entry into positions of State. This corresponds to the character for ‘lu’ 禄, which refers to the register listing the state officials who were to be salaried. Thus, ‘Lu’ refers specifically to social status and he is the God prayed to for the advancement of one’s career, and wealth that comes with having a lofty position, not merely money from, say, a lottery, or an inheritance. Lu is usually depicted dressed in the robes and headdress of a Mandarin and holding a ruyi (sceptre with a broad mushroom-shaped head), which symbolises good wishes. Lu is sometimes also shown wearing a peony blossom, signifying wealth; or carrying gold ingots. The star of longevity (Shou 壽, Shouxing 寿星) is Carinae (Canopus), the star of the south pole in Chinese astronomy, and is believed to control the life spans of mortals. According to legend, this deity was carried in his mother’s womb for ten years before being born, and was already an old man when delivered. Shou is usually depicted with a cheerful expression and having a high, domed forehead. He holds a long staff/walking stick and sometimes carries a peach, the symbol of immortality, or a gourd filled with the elixir of life. One reason why I am so fond of the Three Stars is because I had a Shouxing money bank as a child. The bank issued two different sets of Sanxing money banks, one set in full colour and the other in ivory coloured plastic. I believe my initial deposit was quite a small one and so I got an ivory-coloured Shouxing. It didn’t matter though. I loved the old man with his large head and happy grin and he lived on the top of a chest of drawers, and soon became heavy with spare change. I can’t remember what happened to him after he was filled up. I think he may have been replaced by a porcelain pig. These days I have this set of tiny stars. Unlike other depictions, they are all white haired and their expressions seem slightly weary. I guess being a star can be stressful. My Little Stars [from l]: Fu, Lu and Shou. P.S You may see Fu, Lu and Shou standing in reverse order, with Shou (the old man) on the extreme left. This used to throw me off until I was told to think in terms of Chinese writing being sometimes written (and read) from right to left. When this is the case, Shou’s rightful place is indeed on the left see below).